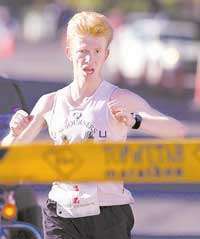 Sasha, I know once before that you commented to me about running either the SLC marathon or the DesNews. Due to my work schedule I'll be in California during the SLC so it's out of the question. I'd still like to run one sometime this summer to see where I'm at before STG marathon. If you were me would you run DesNews or just not run one. I don't want to run the Desnews and get all jacked up so I can't continue to train and make progress for STG. However if I was to run the Desnews and do go it would give me a lot of confidence going into the STG. One the side note I am registered for the Hobble Creek half in Aug and may run the Bryce Canyon half in July. Shasha, keep dreaming, no guts, no glory. No guts is my biggest problem lately. I plan to run too fast the first two miles in the Magna 5K, the last mile will be hell. But, sometimes you just have to let it rip and use a race for breaking a barrier. Good luck saturday. Dreams are great, they may not always come true, but, great for the mind and matter.